GR: More CO2, more warming, more evaporation, and more extreme storms. “It’s a tough fact to get one’s head around. But a warming climate means that many regions will both experience more extreme droughts and more extreme floods. 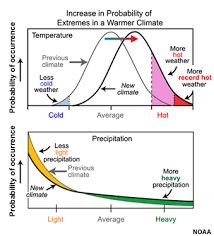 The cause for this new weather severity is that a warming planet produces higher rates of evaporation together with more intense atmospheric convection. Warmer air over land means that the moisture gets baked out of terrain, lakes and rivers faster. And this warming effect causes droughts to settle in more rapidly, to become more intense than we are used to, and to often last for longer periods. As the climate warms, instances of extreme weather — both droughts and floods — increase. Image source: NOAA/UCAR. “On the flip side of this severe weather coin, more moisture evaporating from the world’s lands and oceans means that the atmosphere contains a greater volume of moisture overall. This heavier moisture load enters a hotter, thicker, taller lower atmosphere (troposphere). One that is becoming increasingly stingy about giving up that moisture in the form of precipitation much of the time. All that heat and added convective energy just serves as a big moisture trap. So the load of moisture has to be heavier, overall, to fall out. When the atmospheric moisture hoarding finally relents, it does so with a vengeance. Thicker clouds with higher tops drench lands and seas with heavier volumes of rain and snow. And when the rain does fall from these larger storms, it tends to come, more and more often, in torrents. “A set of facts that were drawn into stark relief recently in California which over the past few years experienced one of its driest periods on record but, in 2017, is on tap to see its wettest year ever recorded for broad regions. In a section of hard-hit Northern California, the cumulative 2017 rainfall average had, as of yesterday (April 9), hit 87.5 inches. The record for the region in all of the past 122 years is 88.5 inches for the entire year. Cumulative precipitation in Northern California set to beat all time record during 2017. Data Source: California Department of Water Resources. Image source: The Sacramento Bee. “It is just early April. But the region tends to receive most of its moisture from January through March. However, all it would take is a relatively minor storm system to tip the scales into record territory. And it now appears likely that this region will see in excess of 90 inches for the present year. This entry was posted in Climate Change, Drought, Extreme Weather, Floods, Global Warming, Storms, Weather and tagged Australia, california, New Zealand, Peru by GarryRogers. Bookmark the permalink.